The mobile industry may be focusing more on improving the cameras and imaging technologies but there are groups who may be content with just coming up with add-ons and accessories. We’re not in the age of modular devices yet but one can enhance a gadget by simply using accessories that you can snap-on, clip, or attach. We’ve seen this idea before, thanks to the light and lenses. Sometimes, you don’t have to take out your compact cam or DSLR just to take premium photos, but the RevolCam allows almost any phone to be transformed into a powerful camera. You can depend on your smartphone to take portraits and landscape shots others would think were captured by a professional photographer. The RevolCam offers different lenses that are swappable. You can easily change the lens as you please depending on the style of images you want. The smartphone is favored by millions of users around the world when it comes to taking photos, so the 'RevolCam' lens solution is here to upgrade it to be that much better. Packing three different lenses into the mix, the device is able to augment photography from the get go rather than requiring effects and changes to be made in post-production. 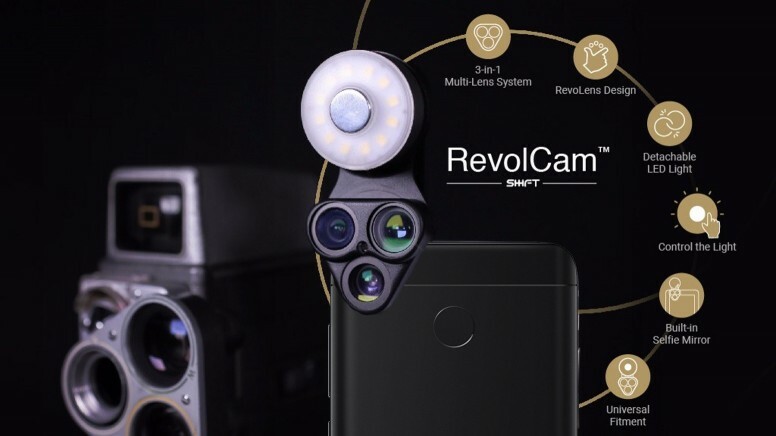 The 'RevolCam' also boasts an adjustable brightness LED flash that will help to expand capabilities without having to deal with the incorporated flash on your smartphone. The unit can be used on a variety of different smartphones and also packs a selfie mirror to let users utilize the more powerful rear camera on the rear of their device rather than the one on the front.